Strawberry Steel Cut Oat Breakfast Bars recipe are perfect for a healthy, easy on-the-go breakfast or snack idea even kids will love! I have another really great guest post for you today while I’m away on vacation and catching some rays! 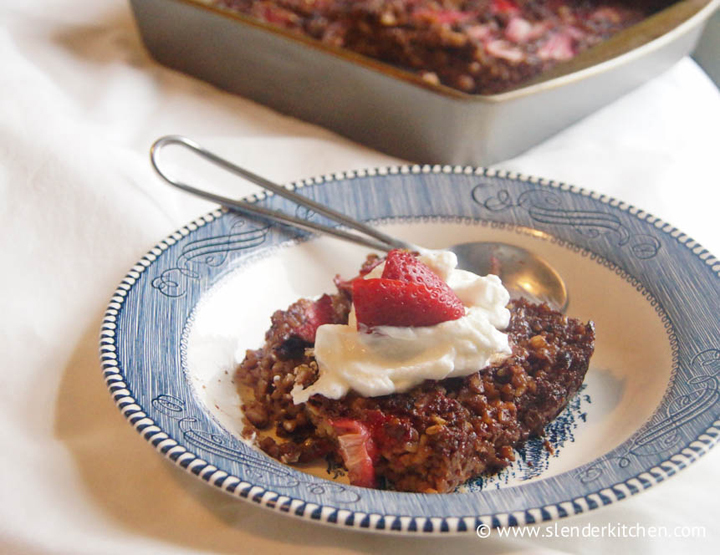 I’m sure most of you know of her already, but my friend Kristen from Slender Kitchen is sharing a recipe for super delicious Strawberry Steel Cut Oat Breakfast Bars with you today. She has a bunch of delicious and healthy Weight Watchers friendly recipes on her blog and makes good, real food that tastes great. Definitely head on over to her blog and say “hi”! Take it away, Kristen! Hi, I’m Kristen from Slender Kitchen and I am so happy to be sharing a recipe with you today. Much like Ashley, about five years I knew absolutely nothing about the kitchen. Other than quick packaged meals and dinner disasters, not much happened in my kitchen. Over time this resulted in lots of wasted money spent on packaged foods and to an ever-expanding waistline. After one horrible day of bathing suit shopping, I finally decided to take action. Knowing I couldn’t successfully lose weight with packaged frozen dinners, I set out to teach myself to cook delicious and healthy meals at home using whole foods and that’s how Slender Kitchen was born. 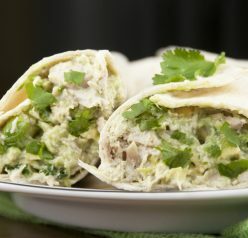 My blog, Slender Kitchen, shares healthy recipes and complete meal plans that are healthy and most importantly delicious. Today’s recipe is one of my favorite go-to breakfast recipes when I want a healthy breakfast option that I can take on the go. 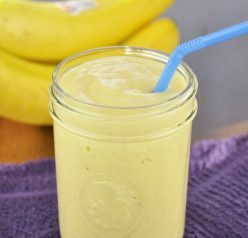 It’s packed with good for your ingredients that will keep you full of energy all morning, but tasty enough that any family member would be happy calling it breakfast. Thanks again, Kristen, for your fantastic guest post! Make sure to head on over to her blog and show her some love. Have a safe and happy Memorial Day weekend! 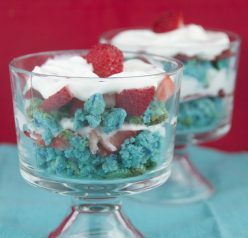 If you’re looking for more fresh strawberry recipes, be sure to check out my collection. You will especially love these strawberry oatmeal bars or these fresh blueberry-lemon oatmeal bars from my friend Cathy! Prepare an 8 X 8 baking dish with cooking spray or parchment paper. Stir together the oats, walnuts, baking soda, cinnamon, and salt. Whisk together the almond milk, egg, butter, brown sugar, and honey. Stir the wet ingredients into the oat mixture. Spread half the strawberries over the bottom of the baking dish. Pour oats on top. Top with remaining strawberries. Option 1: For a more custard like texture, refrigerate for 4 hours or overnight and then follow baking directions. Option 2: For a chewier texture, bake immediately. Bake for 50-55 minutes until oats are cooked through and top is beginning to brown. Let cool and cut into 6-8 bars. I cant tell you how good these look! 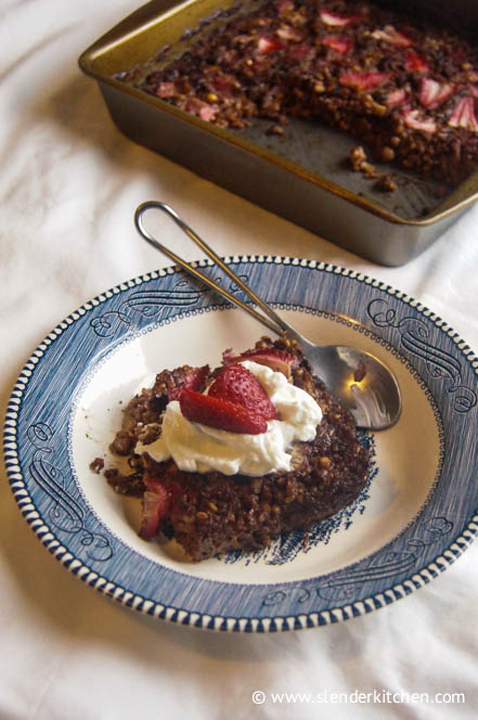 Yum – the coloring on this is absolutely fabulous – and strawberries, oats and walnuts – oh yeah I will have another slice please! Thanks Kristen! I love healthy breakfast bar recipes. Sounds delicious with the strawberries and steel cut oats! I love steel-cut oats but have never made them into bars like this! Such a great idea! Perfect breakfast bars! Need to try these… will plan on giving them a shot this week! Did anyone try this recipe? I tried it and it was mushy and too much liquid that did not bake out. Wonder if I did something wrong or the amount of milk (used 1%) should be lowered. I tried the recipe this morning and I was thinking the same thing? The oatmeal is cooling now, but it was still very liquid after baking. I cooked for an additional 10 minutes but am hoping that it will firm up as it cools. These are in the oven now, and I’m a little concerned about the liquid to oat ratio.